I don't have much knowledge of Transformers. Much of that comes from the old Transformer cartoons and the movie by Michael Bay. So I got this book just for the fun of it. I can't really differentiate which paintings come from which Transformers series. This soft covered art book has contributions from 16 artists. 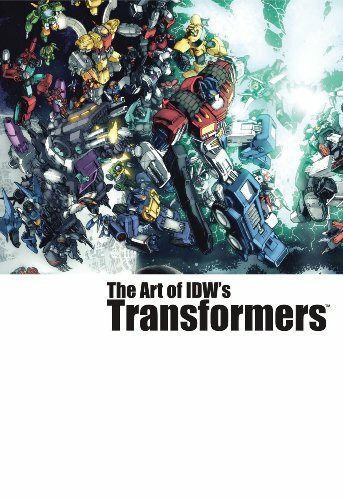 They are MD Bright, Don Figueroa, Guido Guidi, Bob LeFevre, Marcelo Matere, Ed McGuiness, Alex Milne, Milx, Robby Musso, James Raiz, Nick Roche, Rob Ruffolo, Klaus Scherwinski, E.J. Su, Andrew Wildman and Ashley Wood. There's a short interview with each of them before pages of their artwork. There are full page paintings, comic panels and a few line drawings. Most of the art pieces are highly polished. Each artist presents a different style which makes for great variety. I particularly like Ashley Wood's style, which is very raw and has lots of blacks. To me, the actual genre of Transformer is war. That coupled with art makes for action packed panels which fills most of the pages. Every one is attention grabbing, if printed on comic book covers, screams "Buy me to find out what happened!" There aren't any captions for the art. So I didn't learn anything I don't know before, which is nothing. This book is also available in hard cover, but at twice the price on Amazon. The soft cover's not too bad either, at least the paper stock used is good. The soft cover was published in 2008, the hard cover, 2007. Using video footage of you flicking through the book is a really good idea. I'm going to add it to my wishlist for Christmas now, and I wasn't so sure that I was going to before.